Heavy ropes, hangers, hooks, and suspension have completely changed my perception of Cattelan's work. Some pieces are, well, modified in a way that behooves them – the lynched man, the center horse, even the body (maybe). There are different degrees of success and this installation is not really conceived as discrete pieces, but really a work unto itself. Nancy Spector, Chief Curator of the Guggenheim, who worked closely with Cattelan on the exhibition, makes a more literal case for the ropes. Spector explains that the ropes suggest a celebration of Cattelan’s creations and a destruction of them through a sort of death by hanging. This makes sense, as Cattelan has announced the end, the death, of his own career by way of retirement. Technically speaking, Cattelan has completed the typical trajectory of an artist’s career, complete with apotheosis by way of a retrospective exhibition at the Guggenheim. No one, of course, believes that he will retire, so let’s move forward with some other considerations of the show. A bystander asked me a question (maybe my geek glasses gave me away), “Do you know if the curator did this or the artist?” Good question – in this case, it’s quite possible to imagine a curator making such an audacious installation choice. Had a curator made the decision, the ropes, metal hooks, and chaotic amalgamation would have probably flabbergasted most of the critics, so much so that those elements of hanging would be seen as absolute intrusions to the artist’s work. Fortunately, the artist proposed the methods of installation, and thus we have to consider them as an essential component of the work itself. Cattelan now plays with possibilities of conceptual art. His role as curator, artist, and fabricator (many of these works were prefabricated for the show, as it was too difficult or dangerous to hang them)- has now extended to art installer. He takes the essential formalism of the installation and exaggerates it to play with our concept of exhibition. He makes us aware, he toys with us and his artworks, to bring an element of playfulness to pieces that typically have had a more strident tone. All of that seriousness is now gone. Really, this show has nothing similar to the installation in the Punta della Dogana. The solemnity has been lost in an array of cacophony and cliché. The Pope, totally decontextualized, almost looks as if he had been over taken by an epiphany rather than destructed by the cosmos. So, am I sitting on the fence with this one? Maybe. Most of my friends when asked, said “I dunno, I think it cheapens his work.” I agree. But I also agree that Cattelan loves cliché, gimmicks, and pranks. So perhaps this is just another one. Perhaps, that is the Duchamp-esque brilliance of it. This is an experiential show, one that exposes the general public to the playful and serious elements of Cattelan’s work. In many circumstances, unfortunately, the way he balances the two to make pithy yet serious statements on politics and religion, is probably lost on them. Yeah, the show gets people off their seats to see it, but for me, the take away is rather compromised. You can call me a cliché myself in wanting the general public to see art that both entertains and provokes, which Cattelan has been so brilliant at doing. I’m old school that way. 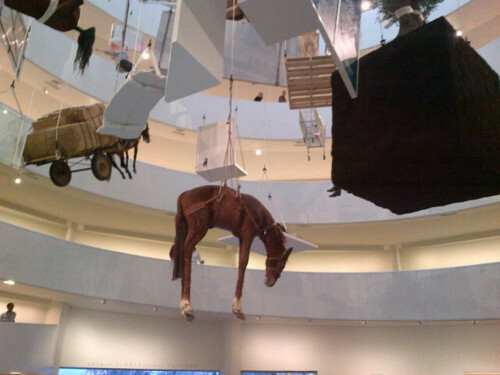 What I do think is a positive take away, is Cattelan’s visual interpretation of art, ideas, and creation. The art making process is not linear, much like the exhibitions we see. Instead, the artist is capable of extracting an idea and “capturing it” in material form – to use a banal expression. This exhibition, with its daring installation, makes that process evident. It makes visible the invisible notion that artists have interests, ideas, and works which surface, die, and resurface. The history of art and the artist is not linear, as we learn in art history 101. It’s messy, requiring multiple viewpoints and is often subject to a super-imposed narrative in order to “make sense” of fact, of the unknown, and of the past. This is, for me, the second brilliant element of the show: a masterful contribution to the greater artistic dialogue. Cattelan’s point is not just one point, not just one point of view, and not just one person’s point of view. Critics and naysayers of contemporary art would say that this is random artspeak. Cattelan, however, makes a significant contribution to institutional critique, as defined by Hans Haacke. This exhibition is, perhaps, a benchmark in that this is the ultimate “accessible show” and with the ultimate “accessible message.” You don’t need background knowledge, art education, or art experience. The third high point of the exhibition is the little drummer. As I scampered down the ramp, taking notes, the introduction of the drummer sound was a call to pay attention. Even though the sound was manufactured, it commanded a different consideration of the show. The drumming sound helped the audience look and listen among the chaos. In institutional critical discussion, most viewers just were interested in pointing to identifying – out of the chaos – what they see: “Oh look inside. There are pigeons.” I am not sure that some viewers’ critical understanding of what was going on went much beyond such remarks. That is more pathetic than anything – reducing art appreciation to the identification of objects. This kind of identification distracts from Cattelan’s work, as those viewers are simply distracted from the concepts. It is the concepts that differentiate art from pure entertainment. However, what we want and what Cattelan wants are clearly different things. Perhaps, he is also clearly collapsing the gap between art and entertainment. Much like a spectacular firework show, people point upwards saying, “Oh! There’s a dead man.” The gap is closed; the conflation of art and entertainment is complete. The consciousness of the viewer of this “play,” or “strategic institutional critique” is probably non-existent. People don’t feel like they are looking at art. They are not necessarily trying to “take it seriously” or “figure out a message.” They are looking and having fun, which is really a masterful stunt of manipulation on Cattelan’s part. He uses the form of conceptual art to critique the role of the artist, curator, creator, exhibitor and ultimately destroyer.